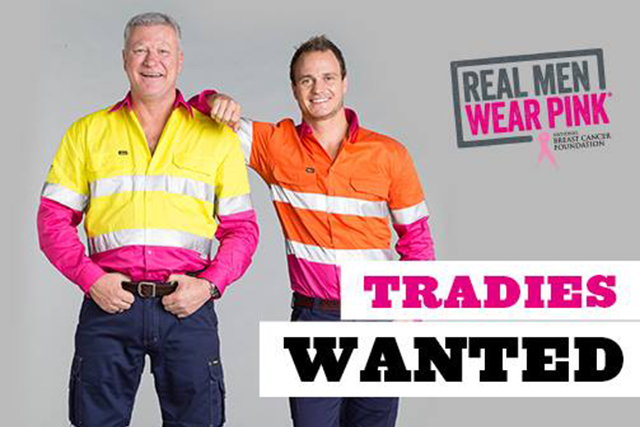 According to The Block host, Scott Cam, the Real Men Wear Pink campaign is about tradesmen, workers and women getting behind the National Breast Cancer Foundation’s awareness campaign. “We all know that individually you can donate to a breast cancer cause,” he says, but now people can participate in the awareness month – with a bit of a twist. Scott is calling on people to be part of this campaign by ‘wearing pink with pride’ or nominating someone else in your workplace. If you are ‘man enough’ to wear pink, nominate yourself and start fundraising today. It’s all a bit of fun. “You get family and friends to support you to wear pink to work. And you know, you gotta be tough enough to wear pink! Tradesmen are tough enough to wear whatever they want!” laughs Scott. Bisley Workwear has come up with a concept with the Breast Cancer Foundation and it’s a “cracking idea” according to Scott. “Imagine the sort of the money that can be raised from Real Men Wear Pink Day if we can continue?” he asks. Scott is urging people to go to realmenwearpink.org.au and to buy a shirt to support this great cause. Many Aussie families have been touched by cancer. Open Colleges also spoke to Scott Cam about how he prepares himself for success. Many would know that prior to finding fame and fortune on TV – he was a hardworking carpenter for over 30 years. Here, Scott shares his business, motivation and career tips with us. Is your “strong work ethic” the secret to your success? Never be late – work hard and don’t complain. Those that work hardest – stand out in the end. Set a positive mindset and prepare for success. The importance of being nice. Or call 1300 708 763.